My card is featured on the Cards Blog!! 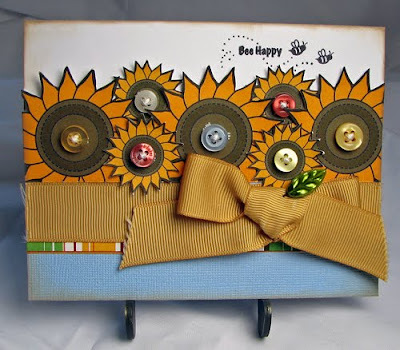 The challenge this week was to use stick pins on a card. I used some sweet Nikki Sivils, Scrapbooker Willow Bee paper and stamps for this one. And the little stiped strip under the ribbon I cut out from some Nikki Sivils packaging. Sorry about the dark picture. One of the lights I use went out. But you can still see those cute sunflowers!! You can check out the other cards on the blog HERE. They are all really cute and show such great use of pins!! I am a little late with everything this week!! So here we go- this week's sketch from scrapbook challenges. You can see what the rest of the DT did with the sketch HERE. 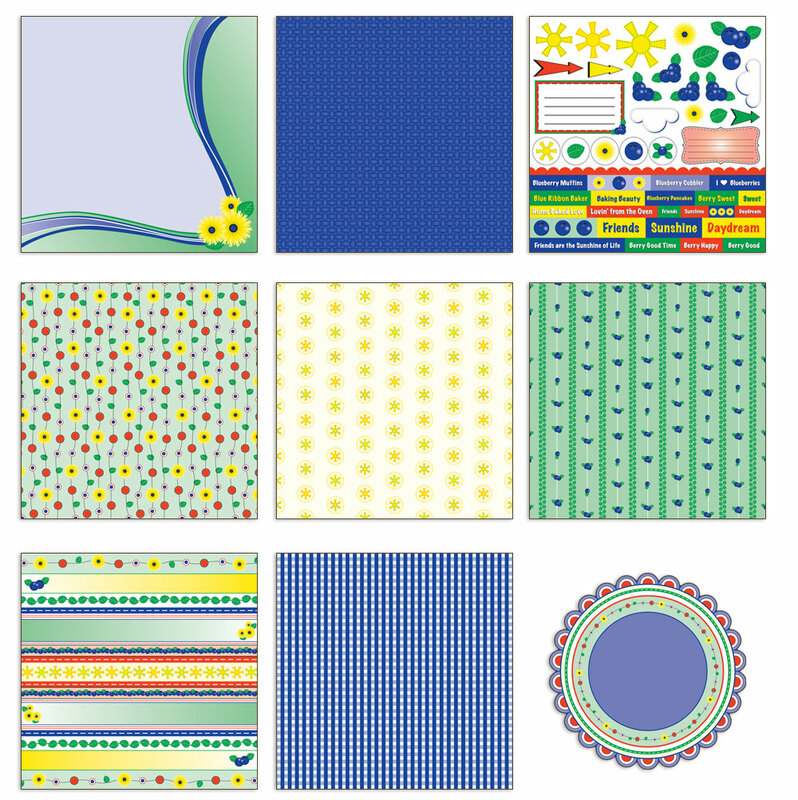 And you have until the end of June to upload your take to the Scrapbook Challenges Gallery to be entered for June's Prize- A stamp set from Pink Persimmon! Simply Obsessed's July kit Hello Sunshine is here!!! I just love this kit!!! My favorite part is those cute, cute, cute Lily Bee rubons. I just couldn't resist using those on both of my layouts. I usually stay away from rubons, but these were just too perfect not to use. 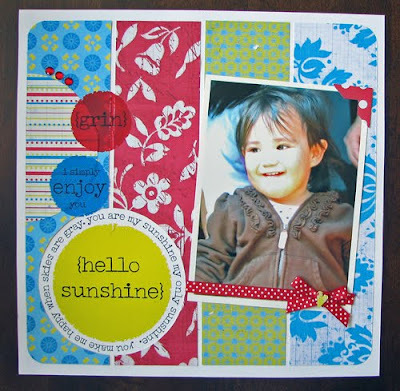 So here is my July Hello Sunshine reveal. For my first layout I cut some of the Lily Bee paper into strips. I wanted the big yellow rubon as my title, but it didn't show up very well on the patterned paper. So I cut a circle just a little bigger than the rubon, traced it on my paper and then cut out the circle. This left me a spot to place to my title! 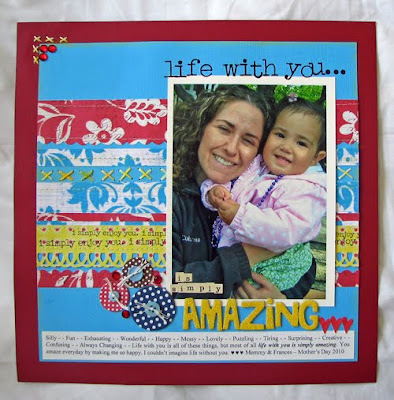 I knew exactly what I wanted to do with this layout when I saw that "life with you" rubon. I cut out strips of the Lily Bee paper, punched them, stitched them and then adhered them to the blue cardstock from the kit that I trimmed to 10.5 inches. I journaled on the bottom all the adjectives that describe life with Frances. Exhausting and tiring are both on there- LOL! On the hand stitching I used yellow chalk to turn the white thread yellow so it matched my paper a little better. And for my last project I made this little card. It is a 4 x 4 card. I added a button to the flower and inked two of the chipboard banner pieces to make leaves. Then see the red paper on top? I cut that out from the label strip on the bottom of Fancy Pants paper. I didn't want that to go to waste after I cut it off!! I hope you enjoyed my Hello Sunshine Reveal. I love this kit!!! 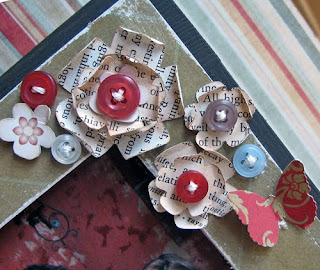 I have lots more paper and embellies to make more projects!!! This kit is SOLD OUT, but if you love it as much as I do you can contact Heather (simplyobsessed@yahoo.com) and she will order one for you!!! 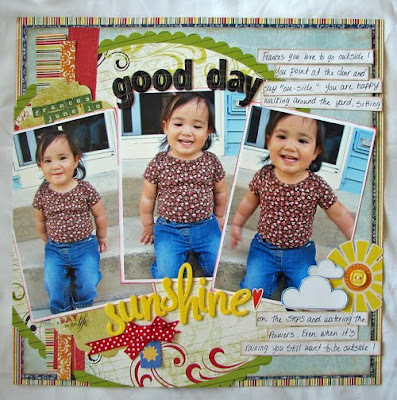 Here is another sneak peak from Nikki Sivils, Scrapbooker!!! Isn't it adorable! 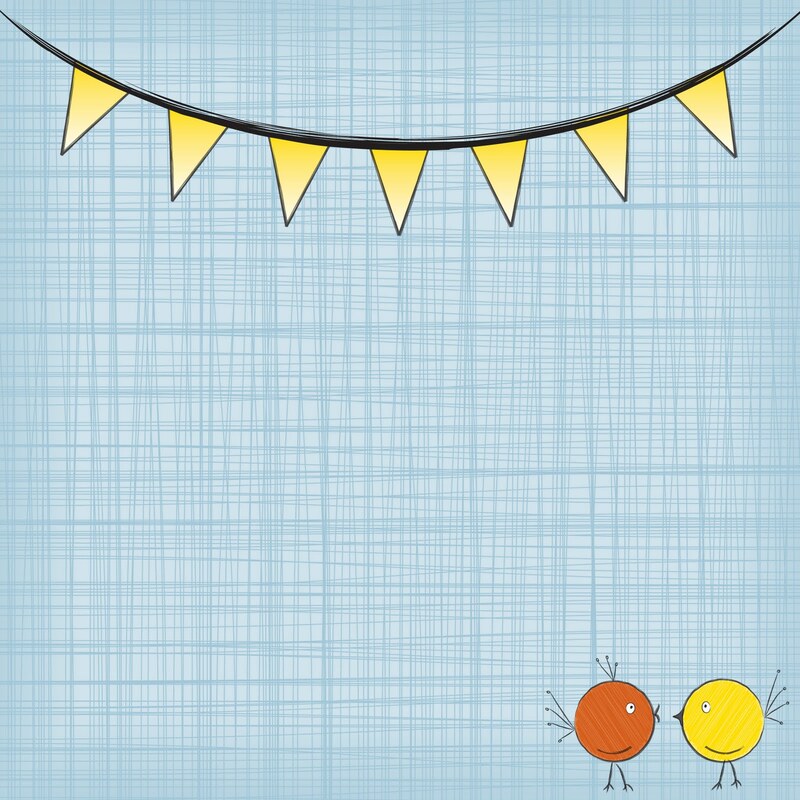 I love the banner and little birdies! Soooo cute!!! 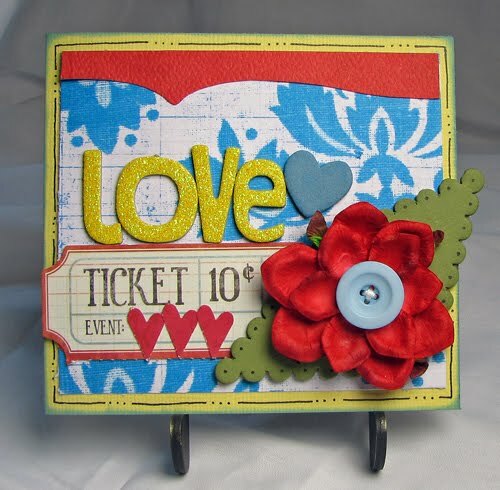 And there is a give away on the Nikki Sivils, Scrapbooker blog!! You can win the entire "Dan the Record Man" line and some sketch books from Allison Davis! Go HERE to enter! 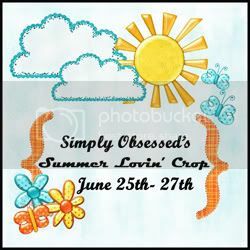 Simply Obsessed Summer Lovin' crop hosted by me!!! 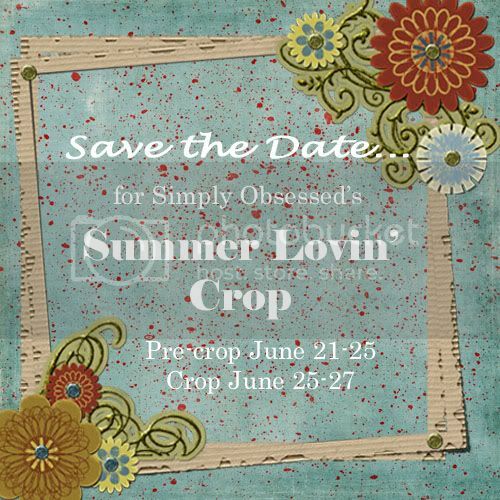 The crop doesn't start until Friday June 25th, but there are already some pre-crop challenges and games posted. There will be fun and prizes. Hope to see you there!! How about a sneak peak?? 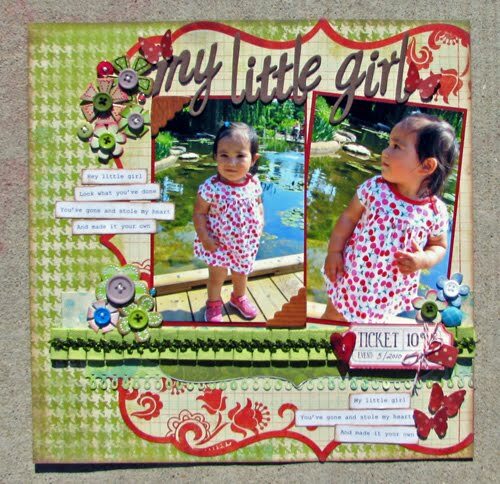 This is one of the new Nikki Sivil's Scrapbooker collections coming out this summer at CHA!! I can't wait to get my hands on it! Isn't it cute!! And Frances's favorite food right now is blueberries. She can eat the whole container in one sitting. She calls them "Bluebees". It is sooooo cute!! 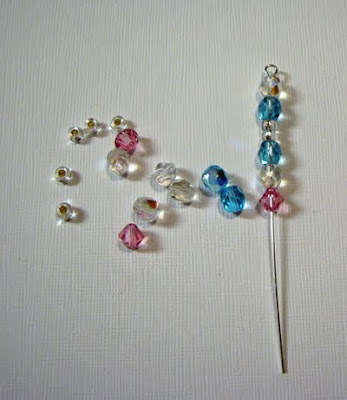 I love to make jewelry and have tons of beads and wire laying around. 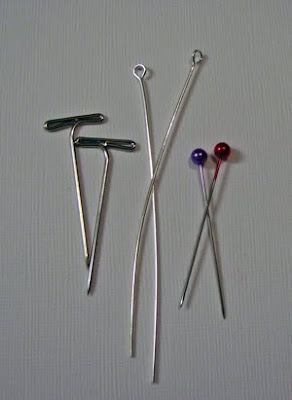 So one day I decided to make some of those fancy decorative pins that are sooo popular right now. I posted this super simple (and I mean simple!) 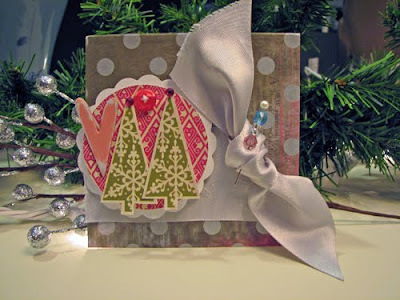 tutorial as a make n' take over on the Simply Obsessed blog last December. Lately it has been getting a ton of hits everyday!! Who knew everyone would like a tutorial so simple? And the pics are terrible!! I put this together at midnight because I spent the day with my daughter in the immediate care center (long story - you can read the original post HERE). So I decided to post this again for anyone who missed it! 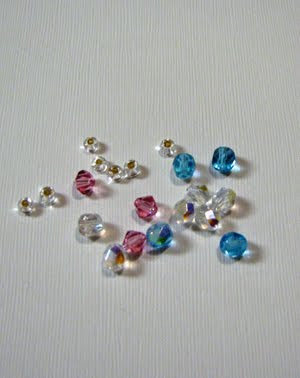 If you check the papers you can buy beads and pins for sooo cheap these literally cost only cents to make. And they take only a few minutes. Gotta love that!!! Have fun! 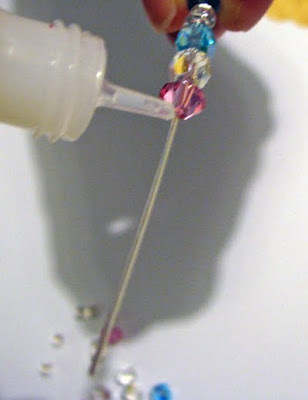 You will need pins, beads of different colors and sizes, and a strong liquid adhesive like glossy accents or diamond glaze. I bought the pins and beads at a Joann's when they were 50% off. 2. Thread the beads on the pins in the desired arrangement. 4. On the bottom of the last bead add a little of the adhesive covering the entire opening of the bead and let dry. 5. These are different pins I made. 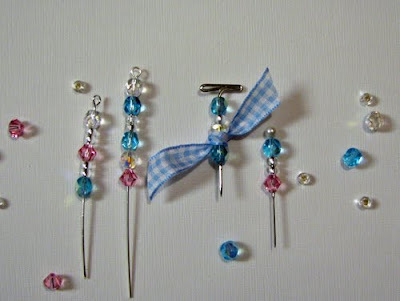 You can embellish them with ribbons or other accents. And here is a card I used one of the pins on. Again sorry for the blurry pics!!! Every month for almost five years a group of 6 girls (including me) have gotten together for our book club. I use book club loosely because we don't actually read a book. Before you laugh let me explain- there are books involved and each of us reads a book (or more) each month (unless we are really busy). So at book club we bring the book we read and everyone takes a turn picking one of the books to take home for that month. It is kind of like a book exchange club. It is really fun and there is no pressure to feel like you HAVE to read a particular book. If you don't like a book you just take it home for the month. The six of us have seen each other get married, have children, move into new houses, have more children, and on and on. We have grown very close over the last five years and try never to miss our monthly club. Sometimes it is a challenge to find a day each month that fits all our busy schedules, but we always make it work because we know if we start canceling for this or that soon we won't meet at all anymore and we don't want that to happen to us. Sadly one of our members is moving and it was her last book club yesterday. It was a bittersweet occasion. One had we are so excited that she is starting a new job in a new city. On the other hand we are going to miss her tremendously and our little group won't be the same without her in it. At our last book club yesterday each of us bought her a book we want her to read and wrote a note inside the cover. I chose "Sick Puppy" by Carl Hiaasan. If you have ever read his books you know they ca-razy. I love them though! I figured she would never forget that crazy book and then never forget about me. Hopefully my thinking is right on this one! Along with the book I made this frame for her to take to her new home. We have a plan to meet every year so we decided each year she would change the picture out with a new one of us. Here are some close ups of the flowers. I used my cricut to cut the flowers out of book pages (because it is book club!) and then layered them. You can see what the DT did with the sketch HERE. And I have some more news to share! I was asked to be on the card design team at Treasured Scrapbooking. I am sooo excited! I tried out for this team three times!! I guess it's true- Never Give Up! 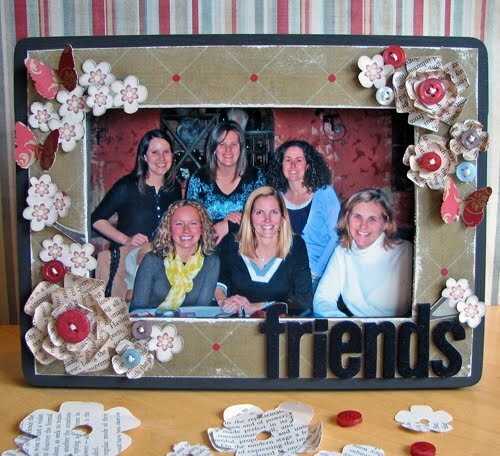 Treasured Scrapbooking has the best card kits, scrapbook kits and forum and I am so happy to be a part of that team! A new blog and a new team! I decided this weekend to give my blog a much needed face lift. Yes, Frances's 3 month picture was adorable, but I needed to spruce the blog up a bit!!! After seeing my scrappy friends Frances and Susans's blogs I fell in love! So I contacted the gal that made it all happen Kristine. Doesn't she do fabulous work!! And so quick too. I just told her a few things I wanted like a sun and butterflies and this appeared this morning!! Isn't it adorable! I am in love with the new look. I can't stop staring at it!!! If you love it as much as I do you may just want to check out Kristine's blog and send her an email. And I am so excited to finally announce that I was asked to join the Nikki Sivils, Scrapbooker team!!!! I have wanted to be on this team since I first saw a sneak of her products over a year ago!! I mean it's like she is designing her papers for me-LOL! I am always drawn to cute, fun products that aren't over girly or over the top. Now I love what other people do with those products and wish I could use some of those, but when I do it never quite looks right. Anyway, I tried out for the team three times! I was going to give up, but my husband said don't give up, one of these times you will make it. I am so glad I listened to him!! When she called to tell me the news I was in the middle of changing Frances's diaper of all things so I couldn't get to the phone. When I checked my phone I saw a number from Missouri and thought no...., it can't be Nikki Sivils calling me. There was no message so I thought yeah, it's not her. I sat for a few minutes and couldn't get the feeling out of my head though. So I called the number back. I couldn't think of anything to say except "Hi this is Sarah someone called me from this number and I couldn't get to my phone in time to answer it"-LOL!! She probably thought I was crazy. She was so nice about it and we chatted for a few minutes about the team. I could have talked to her all day, but again I didn't want her to think I was crazy!!! Here is the announcement. Scroll down to see my name. Hehe!! I can't wait to share all my Nikki Sivil's creations with you!!! Check out Simply Obsessed & a give away!!! Check out Simply Obsessed on the Bella Blvd. blog!!! 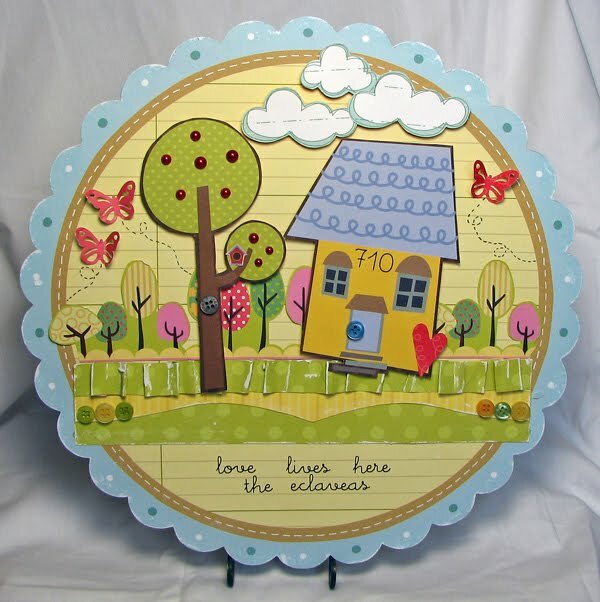 And if you leave a comment you will be entered into a random draw to win one of the June Bella Blvd. kits from Simply Obsessed!! This kit can be girly or manly depending on what you pair with it! I added the ribbon, t-pins, and gel from the kit to give this layout a feminie touch. Then I doodled on the thickers with a white gel pen for fun. And this here is our little guy Bacon. He is 17 and weighs about 7lbs. The picture looks a little dark here, but it is so sweet how he is looking at the window I couldn't resist using it on this page. And lastly a Father's Day card! This kit is perfect for that! Stop by the Bella Blvd blog leave a comment and good luck winning this awesome kit!! 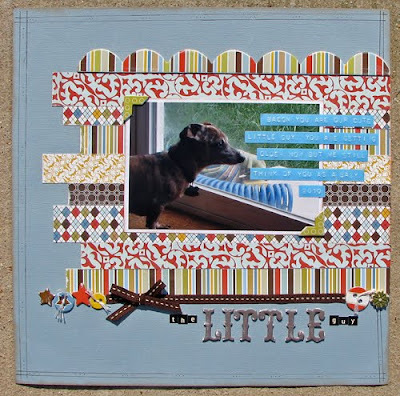 This week's sketch is posted at Scrapbook Challenges. And this month's sponser is Pink Persimmon. They are giving away the cutest set of clear stamps! To be eligible to win complete any June's challenges and upload them to the Scrapbook Challenges Gallery! And you can see what the DT did with the sketch HERE. at challenge masters! 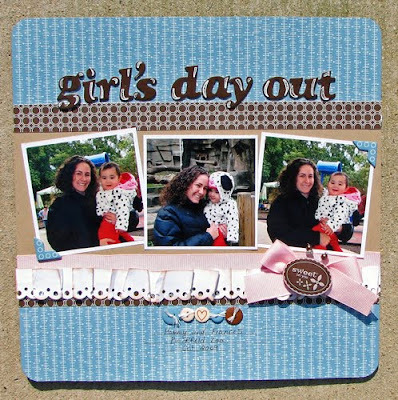 My challenge for this month is scrap outdoor pictures. Yep, it's June and everyone is busy outdoors so I made the challenge easy peasy for you. Just scrap your outdoor pics, that's it! And to celebrate Challenge Masters' new home (we just moved from the NING site) Terri the owner is doing a random draw for a $30.00 gift card to an online scrap store of your choice! All you have to do to enter is complete one of June's challenges and upload it to the challenge masters gallery. And now for my example layout. Here are my outdoor pics. 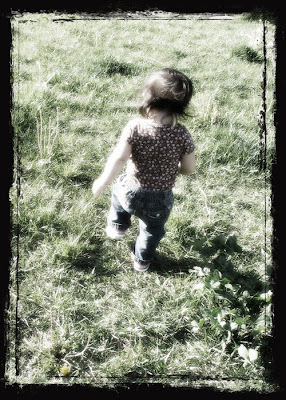 These were taken at the park by our house one Saturday. 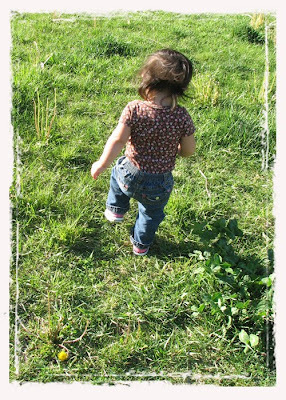 The title and journaling is from the Jack Johnson song "My Little Girl". The journaling says "Hey little girl look what you've done. You've gone and stole my heart and made it your own. 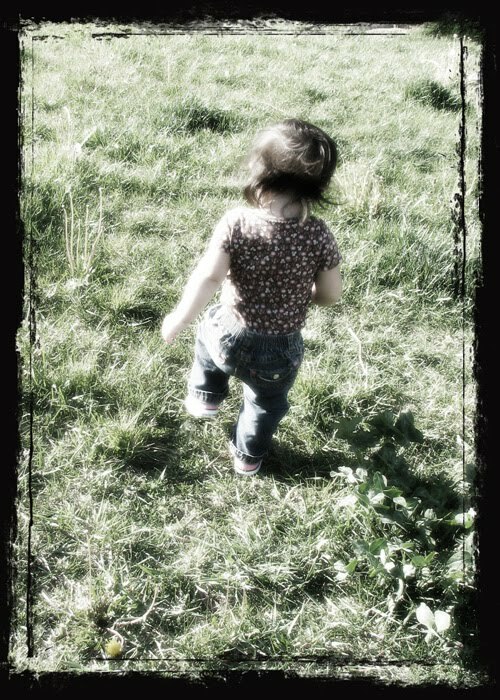 My little girl. You've gone and stole my heart and made it your own." Don't you just love that frame?? I can't stop using it! Thanks for stopping by! 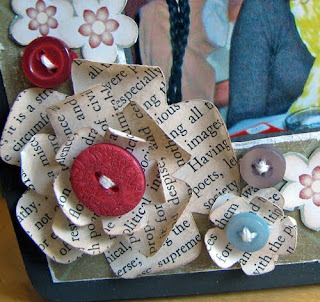 Last month I was asked to be a guest designer for Scrapstreet.com magazine by Pamela Young! It is so exciting because I have never been "asked" to do anything scrappy before. Usually I am doing the asking - lol! After stressing about my layout I finally got it done right before the deadline. I was nervous for two reasons- #1. What if she doesn't like it? and #2. It had to be a page about me and well, I am just no good at talking about myself. 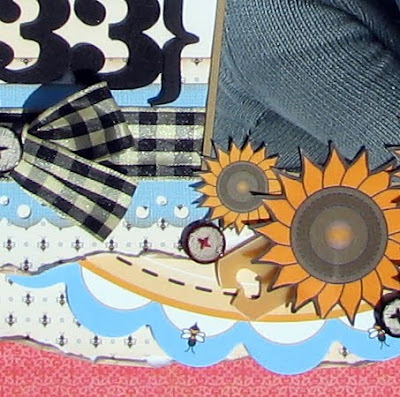 The layout will be coming out in the July issue so I can't show you just yet, but here is a little sneak peek! If you haven't seen Scrapstreet magazine you should check it out. It has a lot of great pages and best of all, it is free for a subscription! I hope everyone is having a great June!! It is soooo nice here today. Not too hot, not too cold, perfect for sitting out in the backyard. I have one project to share today. I almost forgot about this one! This is a wall hanging that I made for the My Little Shoebox DT call. I am not getting my hopes up on this one, but I love the product so I thought why not? I did a lot paper cutting for this one. I cut out the clouds, house, tree, and that cute little bird house in the tree. I got out my tiny scissors for that one! Then I folded and sanded a strip of the green paper to make the grass. To finish it off I punched butterflies with my Martha Stewart punch and added the Kaiser pearls to the tree. Hello June!!! Father's day is almost here. Do you have a card yet? 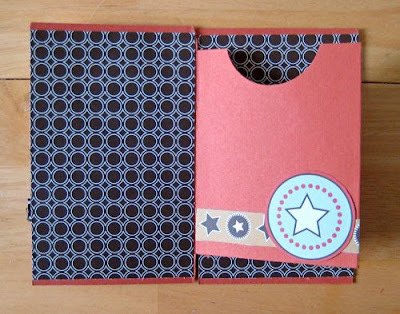 If not you can make one of these nifty gift card holders! 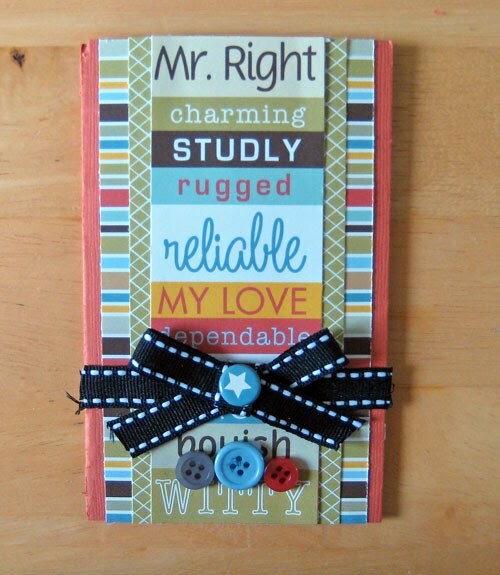 I saw a gift card holder like this on one of the manufacturer's blogs. I just can't remember which one it was. I simplified it a little and made a few changes here and there to make it a little easier, but it is not my idea alone. I am just passing on the inspiration. 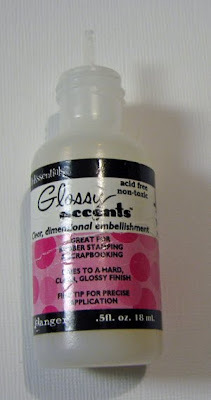 All the directions can be found HERE on the Simply Obsessed Blog. These would be perfect for birthdays, showers, thank you's, etc. 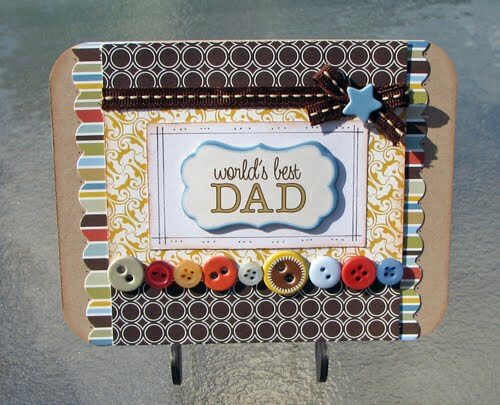 Happy June and Happy Father's Day! And I think there are still a few June SO kits left!